You’ve no doubt heard about “The Cloud”, but what is it? How is this something that can help your business? Put simply, cloud computing services allow you to use software and computer resources online as a utility, allowing you to pay for those resources when you need them, provided via the web as a monthly service. This means moving away from considering software as a product, being replaced by online services. The actual work of any applications is actually performed in the cloud, rather than on the user’s machine. Users are using an interface where they can access the data that is being processed online. This allows for more complex tasks that would traditionally have been seen as beyond the scope for traditional budget computers to be performed online, with the customer gaining the results they need at more affordable prices. 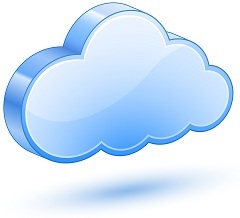 How Can Cloud Computing Help Your Business? The number one consideration is cost. As more functionality is taken off site, through needing less powerful machines, you can reduce your physical technology costs. Disaster recovery is equally important. If you have all your local servers at the physical location of your office, running your email and information storage, what would you do if there was a fire or other natural disaster? Do you have off site backups? Accessibility of the data is also vital. Business is rarely conducted just in the office these days, and being able to access everything you need remotely wherever you are working is important.